This page contains tips and advice about growing fruit trees. 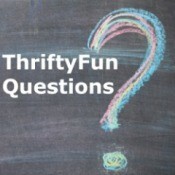 Coffee Grounds for Citrus Trees? Lemon Tree With "Sweating Leaves"
Why Do Oranges Fall Before They Are Ripe? Will Lemon Trees Growing From Root Suckers Produce? How Long Before Peach Pits Sprout? Are There Green Plum Trees? What Does a Bing Cherry Sapling Look Like? 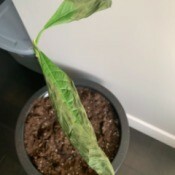 Avocado Has White Waxy LeavesI have an 1 month old avocado tree. It has a few leaves that are white, thick, and waxy. They just keep the same shape and are a little twisted. They look very different from the other leaves. What it is? Leaves on Avocado Plant WiltingI have an avocado plant started from a pit. I have no idea what kind. It rooted great in water so we transplanted it into a small pot. A few months ago we transplanted it to a larger pot and have noticed the few leaves it has are wilting. It gets watered a bit once a week. Are we under watering? Does it need more sun? Avocado Tree Losing LeavesI have an avocado tree that is about 5-6 yrs old. It has occasionally dropped leaves, but they have always grown back. However, since it has become winter, the avocado will grow some leaves, and then a few days-weeks later they will shrivel up and fall off. The ones that grow back appear to be mostly on the top of the tree. 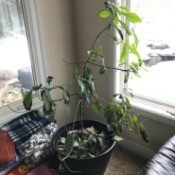 Indoor Avocado Tree Losing Its LeavesWhat causes the buds to drop from a healthy indoor grown avocado tree. The tree is about 4 1/2 feet tall. Two other trees don't seem to have the same problem. Leaves Dying on Avocado After TransplantI have two avocado trees, one is one year old and the other is 2 years old. The containers where I have them planted are getting small and I decided to transfer them to another bigger container and after a week their leaves became brown and they are dying. Can you tell me why? 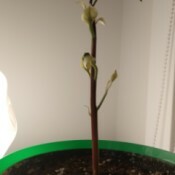 Transplanting an Avocado Tree Grown from a SeedI live in Michigan and I sprouted a Mexican avocado seed. I planted it in a 16oz. plastic cup. It's about 1' tall and I'm not sure when I should transplant it into a bigger container. It looks really healthy. I will be raising it in my house. So do they like the sun or are they like more shade? I'm feeding it Miracle Gro and it loves it. I have it in my south window.